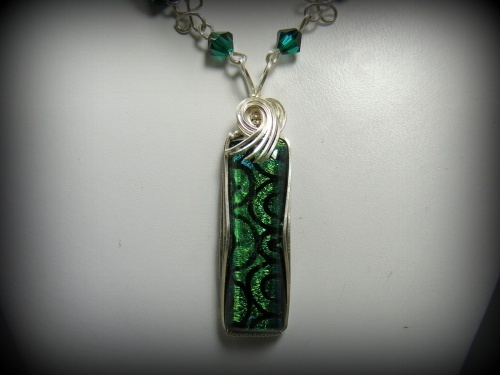 This beautiful deep green handmade dichroic glass focal is unique in desigh with the black swirls in it making the piece really pop. Enhanced with sterling silver swirls makes a dramatic union of colors. Beads are also handmade dichroic pieces with accompaniying deep green austrian Swarovski crystal. Truly one of a kind piece. Measures 19".